Leila Hyams just heard something go bump in the night. 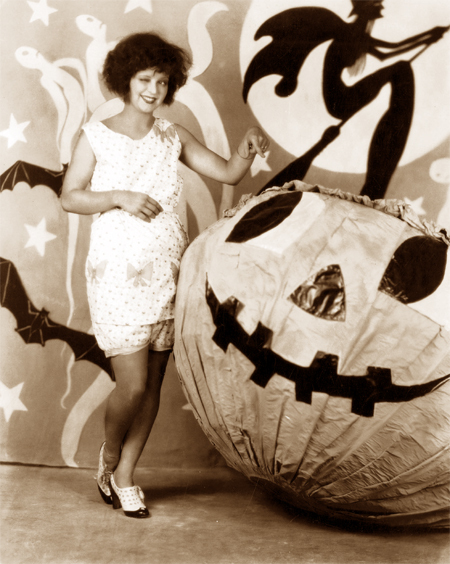 Clara Bow’s ready for a Halloween party. 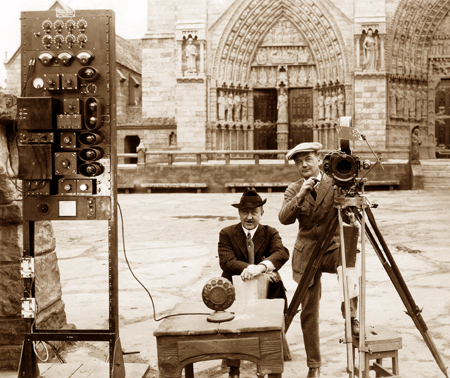 For a project like The Hunchback of Notre Dame (1923), with hundreds of extras and huge outdoor sets, a simple megaphone won’t do. Director Wallace Worsley gives orders by radio without having to shout. 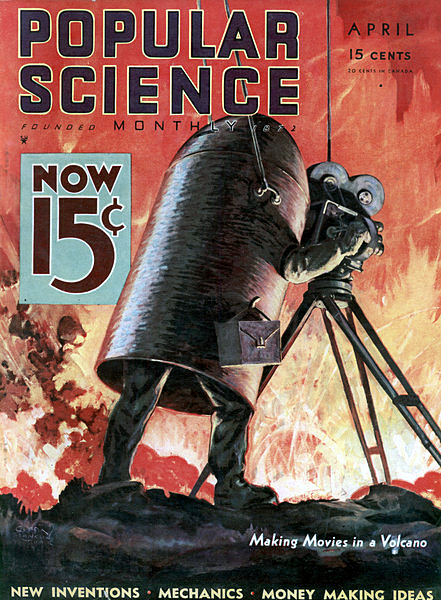 Late in its life, Movie Weekly went to color covers, but diminishing circulation (and a 50% hike in its cover price) finally killed the magazine. If you love silent movies, you’ve just gotta love Movie Weekly, but this happily unpretentious little magazine has been overlooked for 85 years now. I can understand why. With articles like “Why the Screen Stars Change Their Names,” it’s about as lightweight as it can be. It’s not necessarily an infallible source of verifiable journalistic integrity, either (though I haven’t seen very many flat-out lies in its pages). But there just isn’t anything else like it. Imagine a magazine all about silent movies, written by a twisted genius whose mind was 60% that of William K. Everson and 40% that of Howard Stern. That’s Movie Weekly. Look at that teaser! Movie School Students Forced to Endure “Petting!” How could anyone not want to read that article? Film fans of the 1920s could find some fairly serious reporting about the movies in the dignified, and very worthy, Photoplay and Motion Picture. There were lots of photos and clowning in Film Fun, erudite profiles and short stories in Classic, and high-art pretension in Shadowland. But Movie Weekly operated on a whole different level. Where else would you find movie star interviews like “Lewis Stone Tells How Women Can Be Fooled” (February 24, 1923) or “I Shall Marry a Man of My Own Race” (November 17, 1923)? Every now and then, a prominent film star would visit the editorial offices and “edit” the next issue, selecting photos to be run and writing their own captions for the lead articles. Everyone from Baby Peggy to William S. Hart “edited” an issue of Movie Weekly… including Bebe Daniels. Even Valentino put his stamp on an issue, which turned out particularly well for anyone wanting loads of articles about Rudolph Valentino. It tends to be a bit pricy on eBay. The covers often featured up-and-coming starlets, many of whom never got very far in Hollywood. Clara Bow was an unknown when she was a Movie Weekly cover girl in 1923. Jean Arthur made the cover that September, years before finding screen stardom. I’ve been collecting issues of Movie Weekly for years, and I have digital images of other issues as well. Hopefully I’ve whetted your appetite for more of this mischievous, rambunctious and occasionally devious little magazine. To be honest, its articles generally aren’t as lurid or scandalous as their titles imply. But they’re still fun, and often enlightening. I plan to run selected articles as a regular feature of this blog, for as long as you guys seem to enjoy them. Margaret Leahy was an English beauty contest winner who was awarded a guaranteed role in a Hollywood movie. Producer Joseph Schenck gave her the female second lead in Norma Talmadge’s Within the Law (1923), but she proved so unsatisfactory that she was replaced after a week and hastily assigned to Buster Keaton’s The Three Ages (1923) instead, a consolation prize that relieved Schenck of his contractual obligations. There were no subsequent roles, and she spent the rest of her life despising Hollywood. Click on the image to enlarge it. From the same issue. Click on the image to enlarge. A bit of premature optimism, from the same issue. Click on the image to enlarge. No, it’s not an experimental wide-screen camera. 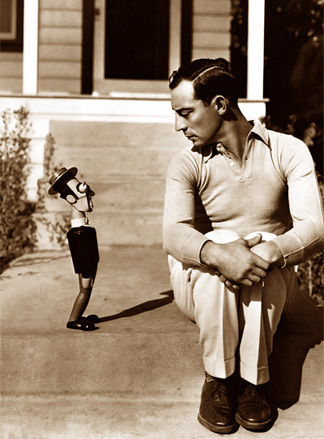 This is just a gag photo to promote M-G-M’s Twelve Miles Out (1927). 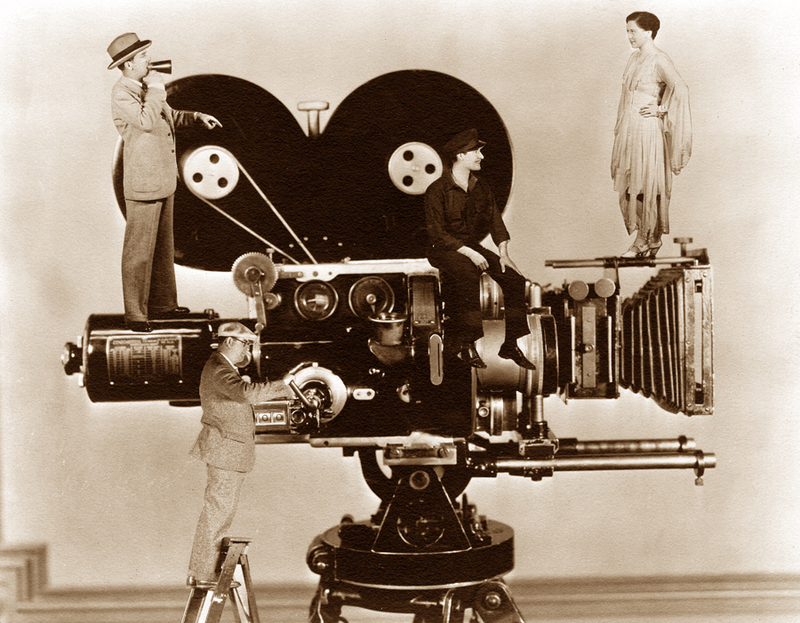 Click on the image to get a better look at director Jack Conway, cinematographer Ira Morgan, and stars John Gilbert and Joan Crawford. Good news: you’re the cinematographer for Erich von Stroheim’s next picture. Bad news: it involves an Austrian volcano. The July 1929 issue. Lupe Velez plays pirate for illustrator Enoch Bolles. Following the era of corsets, bustles and buttoned-up shoes came the Roaring ‘Twenties… and women could roar with the best of ’em. The five-wheeled Briggs & Stratton Flyer doesn’t have a lot of power, but it suits this gal just fine. Besides, that open-carriage design is great for showing off your outfit. 1920. Dancer/actress Gilda Gray relaxes between scenes of Aloma of the South Seas (1926), playing the game of puff with the film’s set dressers. In January 1929, M-G-M sent starlets Janis Paige (left) and Raquel Torres up to the mountains for wintry publicity photos like this one. Beach parties were better before Frankie Avalon. That rookie in the roomy Hollywood Stars uniform is Clara Bow. Thanks to the Stars’ chronic attendance problem, no one in the center-field bleachers will be hurt when Clara clocks a homer. Not exactly running on empty. Words can’t express how jealous I am of this girl. 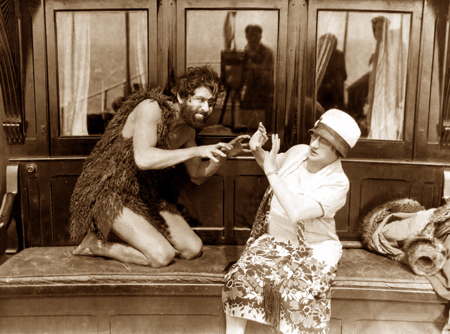 Ben Lyon’s mother visited her son on the set of The Savage (1926), the perfect opportunity for a publicity photo. Also appearing: the photographer… or at least his reflection. The groundbreaking. Here, on San Francisco’s Market Street, would be built the largest, grandest and most opulent Fox Theater west of the Mississippi. 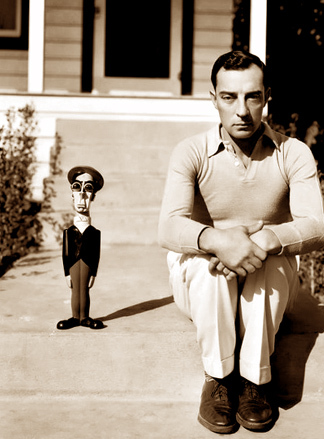 In the late silent era, two dominant trends were underway in the movie business. One was the transition to soundtracks. The story of Warner Bros.’ Vitaphone, and its triumph in The Jazz Singer (1927), is well known. But the rival process, Fox’s Movietone, sounded just as good and never went out of sync. Fox didn’t have Al Jolson, but it did have sound footage of Charles Lindbergh taking off for France, and that was just as compelling to audiences of the time, if not more so. In the end, Movietone won. Anyway, the other big trend was the race to build showcase theaters in every large American city. Here again Fox was a leading player, and the success of Movietone encouraged the company to spend whatever it took to show up the competition. It made sense to scale up. The theaters cost a fortune to build, but they could seat thousands of upper- and middle-class patrons paying top dollar for the experience of a first-class show. With a little luck, an outfit like Fox could make a profit on its latest film just by showcasing it in the company’s flagship theaters; afterward, the film could make the rounds of the neighborhood and small-town theaters, and gross even more. The San Francisco Fox was built to be the last word in film presentation. It seated over 4600 customers. The lobby alone was eighty feet long, forty feet wide and seventy-five feet high, and had its own pipe organ, so customers could enjoy music on the journey to the auditorium. The auditorium boasted a pipe organ so enormous that only four others in the country compared, and none was larger. The domed ceiling was 110 feet up, and the throw from the projection booth to the screen was 212 feet. High up in the back of the auditorium was a private theater with enough seating for several dozen executives or visiting celebrities. The lobby, under construction. Early 1929. High above the lobby floor, serial star Ruth Roland balances on a two-by-four, a can of gold paint in one hand and a brush in the other. May 13, 1929. Opening night: June 28, 1929. The feature presentation is Fox’s premiere of Behind That Curtain, a talkie featuring a then-obscure detective character named Charlie Chan. But that’s only the icing on the cake. There are also dedication ceremonies, a full-scale musical presentation on stage and Hollywood stars in attendance. The Fox opened very late in the silent era. Fox had gone virtually full-tilt for talkies by this time, but the theater also screened a lot of M-G-M releases, among them silents like Garbo’s The Single Standard and The Kiss, and Lon Chaney’s Where East is East and Thunder. There were always stage presentations, too, typically musical programs and a full orchestra. There were personal appearances as well. Laurel and Hardy appeared at the Fox for the week of November 22, 1929. In their act, the boys walked onstage and got into an argument that escalated until they were tearing each other’s clothes to bits. Their director, James Parrott, stepped in and ended up having his own tuxedo shredded. A plant from the audience and the theatre’s emcee also got caught in the melee. The crowds loved it. San Francisco awaits another evening at the fabulous Fox. This week’s feature is Lucky Star with Janet Gaynor and Charles Farrell. Summer 1929. A behind-the-scenes view of the auditorium and stage area, with the mighty Wurlitzer at lower left. William Fox’s movie empire was shaken by the stock market crash of October-November 1929. His films were still successful, but he’d been on a buying binge, of which theater construction was just a portion. Suddenly the mogul owed millions to his bankers, and with the economy slipping from recession to depression, the bankers took over. The Fox Theaters were re-organized, and while they remained first-class picture palaces, there were cutbacks. The San Francisco Fox closed its doors in October 1932. When it re-opened on April 1, 1933, the lavish stage shows were largely over with, and double features became the norm. The theater adapted to the times with its chin up. Live performances returned for a time, though now it was vaudeville rather than full orchestras. The Fox remained the city’s dominant theater through the war years and beyond. There were some special engagements, and more than a few films were held over week after week (as late as 1956, The King and I ran for nearly nine weeks). But the world was changing. As with other major American cities, San Francisco saw its comfortable class of citizens move to the suburbs in large numbers. Downtown lost its shine, and turned a little gritty. Television hit the movie industry hard; theaters large and small found it tougher to turn a profit. By 1961, the Fox was running things like Alakazam the Great and Snow White and the Three Stooges. The handwriting was on the wall. But the Fox didn’t die quietly. The Bolshoi Ballet performed there that year, and the theater became an occasional convention destination. Midnight organ concerts brought new audiences. Still, senior management of Fox West Coast Theaters elected to close the theater before its fiscal decline could turn into disaster. It was hoped that the city would buy the theater, but it didn’t. There were fears that the city would be saddled with a white elephant, one requiring regular maintenance. This decision brought some dismay, because while the urban preservation movement had not been born yet, the Fox had its fans. After a third of a century, the Fox sells its final tickets. Looks like someone knows there’s a photographer watching. February 16, 1963. When the end finally came, it seemed as if the entire city wanted to say goodbye. There were four farewell events, culminating in a grand finale on February 16, 1963. A capacity crowd was there. The film program, ironically, was the television production Hollywood: The Fabulous Era (1962), but that was just one dish at the nostalgia banquet. Celebrities on hand included Jane Russell and Jane Wyman, as well as the nearly-forgotten Lois Moran, who’d been the leading lady of the Fox’s debut movie, Behind That Curtain, back in 1929. The grand old Wurlitzer thundered a medley of songs, concluding with the local favorite, “San Francisco,” the title tune from the 1936 film of the same name. At the end of the evening’s program, the dignitaries joined hands and sang “Auld Lang Syne” on the empty stage, with all curtains raised clear back to the far wall. The lights went out, one bank at a time, until only a lone bare worklight remained, hanging from the ceiling. A stagehand walked over and turned out that light. The next day. Blowing it out to the bare walls. The day after the final farewell, the Fox’s furnishings were sold off, to whoever wanted them, for whatever they’d bring. Many, if not most of the theater’s treasures had been there since 1929, and had been gathered from all over the world. Now, cash was king. Some articles brought a healthy price (the ornate box office sold for $9,000), while others sold for a pittance (ninety custom ashtrays, $25 for the lot). Whatever didn’t sell would wait for the wrecking ball. Keith Rockwell, the new owner of the Fox box office. Stanley Mical dismantles theater seats he’s just bought. Much of the destruction took place late at night. The grand entrance was the last to go. New construction soon went up where the Fox had stood. It’s still there, a massive but faceless hulk of office and living space, built in the cold, sleek modernist style of the 1960s. I don’t have a picture of it. I don’t want one.